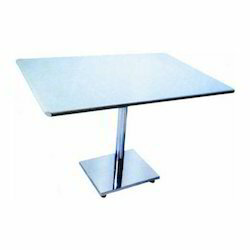 Manufacturer of a wide range of products which include stainless steel table. We are the highest quality manufacturers and supplier of Stainless Steel Furniture in India. A comprehensive range of Stainless Steel Furniture is offered by us, which is widely demanded by the diverse clients.These clients belong to pharmaceutical, chemical industry, medical industry, etc. Our Stainless Steel Furniture is available at the most competitive prices for the clients. We also undertake the customized fabrication work of stainless steel furniture.